The Center for Contemporary Islam (CCI) is part of the Department of Religious Studies at the University of Cape Town. CCI was founded in 1995 in response to the Department of Religious Studies’ mission to understand and study various aspects of religion in contemporary African society. Many projects have been completed at CCI, whether independently or in collaboration with other scholars and institutes from all over the world. 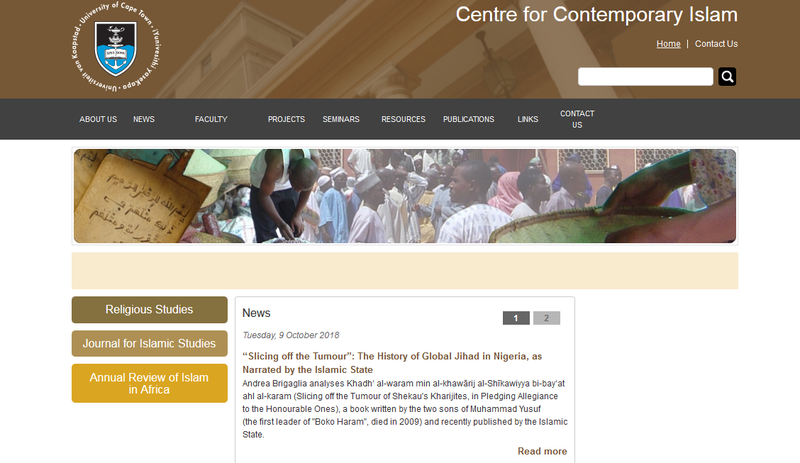 Projects cover a wide range of topics related to Islam and Muslim society such as: Islamic Law in Africa; Religion, Culture and Identity in post-apartheid South Africa; Muslim Publics in Africa; Islam, Gender and Sexuality; Islam and Manuscript Cultures in sub-Saharan Africa; and Muslim Intellectuals in the Lake Chad Transnational Space. The Annual Review of Islam in Africa (ARIA) – a forum for young and established researchers to publish their findings in a shorter and accessible format. 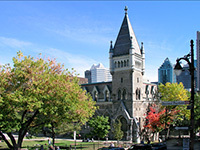 JIS can be accessed through McGIll Library from here. ARIA is also accessible online from 1998 to 2016 click here. Syrian Prints Archive is an independent documentary initiative “without any political, partisan or religious affiliations”, that provides archiving and storing services for Syrian print media issued since the outbreak of the March 2011 Revolution, regardless of content or orientations. Between March 2011 and the end of 2014, Syrian media witnessed a significance rise in the number of print publications. These publications showcase the development of Syrian media and represent the new attempts at pluralism in Syria. Furthermore, the intellectual, social, political, economic and literary content of Syrian print publications is an important part of Syria’s recent memory, which documents a significant stage of the country’s history. However, approximately 70% of these publications are no longer published due to various factors such as printing, technical or marketing problems, as well as a lack of reliable and stable host platforms. The value of these publications and their preservation were among the initial incentives to preserve and provide access to this huge collection. In November 2014, the website Syrian Prints Archive was officially launched during the first conference of Syrian Journalist Association in Gaziantep, sponsored by NPA. This archive provides various interesting and helpful browsing and searching features. Aside from being fully text searchable, the site offers other useful search criteria. Searches can be conducted using titles and personal names along with complete references to associated articles and a number of related publications. Moreover this archives presents a variety of informatics info-graphs containing useful statistics on Syrian print publications. أرشيف المجلات الدبية والثقافية العربية This is an open access archive of various Arabic resources, containing digitized journals, books and articles from all over the Arab world. This archive aims to preserve Arabic literature and cultural heritage as well as serving research and educational purposes. For that reason, a great number of journals (201), books (20,996) and articles (268,065) have been digitized. The collection covers a long period of time, ranging from journals dated in 1876 up to the present from different countries such as, Egypt, Syria, Iraq, Palestine, Lebanon, and Algeria. أرشيف المجلات الادبية والثقافية العربية is a searchable archive. Journals can be browsed by title and books are listed based on the author’s name. The Journal of Islamic Ethics is a full Open Access online journal sponsored by the Research Center of Islamic Legislation and Ethics affiliated to the College of Islamic Studies, Hamad Bin Khalifa University, Doha, Qatar, and accessible from Brill Online Books and Journals platform. Al-Quds open archive is the result of a collaboration between the Center for Palestine Studies at Columbia University (CPS) and the Institute for Palestine Studies in Ramallah. Since its foundation in 2010, to honor the legacy of Professor Edward Said who taught at Columbia University for forty years, the Center for Palestine Studies has been involved numerous projects including the publication of the Jerusalem Quarterly, a film based project called Dreams of a Nation, and Al-Quds open archive. Al-Quds open archive includes 392 issues published between 1908 and 1914. The Index allows visitors to access the scanned issues by number. Documents first display in a reader, and the PDF file opens when clicking on the pop-out icon located at the top right hand side of the document. Those high definition PDFs can be downloaded and printed. The website is in English. The Directory of Free Arab Journals (DFAJ) is an initiative of Middle Eastern Open Access activists aiming at producing a directory of all open access (OA) scientific journals produced in Arab countries. DFAJ currently includes 250 journals from 172 publishers in 17 Arab countries. The directory is published under a CC-BY-NC license. Initially launched in 2013, a new version was released in March 2017.
standard information such as ISSN, publisherp, country of publication, frequency, keywords, etc. Ankara Üniversitesi Gazeteler Veri Tabanı is a modest but nevertheless interesting digital collection of digitized Turkish newspapers published at the end of the 19th and beginning of the 20th century. Examples of titles included in the collection are: Cumhuriyet, Hakimiyet-i Milliye, Tercüman-ı Hakikat, or Zaman. At the time of our visit, the collection counted eighteen titles accessible from the main page (click on the title). We were not able to find a description of the project specifying if the collection is a continually updated resource or if it is complete as is. Issues can be either read or downloaded in PDF format. And a search tool (keyword, title, and author fields) available at the top of each page allows for basic navigation. Although very simple, this website remains valuable given the content it provides access to. The interface is available in Turkish only. McGill Library has now subscribed to the Islamic Studies Collection of AlManhal database which gives access to thousands of electronic scholarly books and journals in Arabic. The collection is full-text searchable in English and in Arabic, and browsable by subject, by title or by publisher. Documents can be read online, listened to, downloaded in PDF, or printed. And the reader offers interesting features such as sharing, annotating, citing or highlighting the text. Check it out, and let us know what you think! جرائد [Jara’id] is a database of Palestinian newspapers published between 1908 and 1948. This initiative, led by the National Library of Israel, consists in digitizing periodicals from its collections to make them widely available. If the first phase of the project focused on two date ranges: 1908-1920 and 1945-1948 -which explains why only a few years are currently accessible for some titles- but the goal is to continue digitizing in order to provide an exhaustive archive of the Ottoman and mandatory Palestine period. a series of buttons to share (Twitter and Facebook), print, mail, download (in PDF), pin, link to a specific journal. The website is trilingual: Arabic, English, Hebrew. MIDEO –Miscellanies of the Dominican Institute for Oriental Studies in Cairo– is a living periodical started in 1954 by the Dominican Institute for Oriental Studies’ first members. The IDEO was established in 1950, in Cairo, and focuses on the study of the sources of the Arab and Islamic civilization. Today, it has become a well-known research center. The Miscellanies include essentially academical contributions,in French, English or Arabic, from members of the Institute and from scholars collaborating with them. The tables of contents of volumes 1-30 are available on the IDEO’s website, and volumes 31 onward are full-text available on revues.org. The call for contributions for next issue (vol. 33 / 2018) focusing on Muslim theology of religions is accessible here. Deadline for submissions is April 1st, 2017.